Downloading Applications it is not an easy task. A lot of time free downloaded applications will ask your permission for third party applications installations. Third party application installation is not necessarily bad but it is good for you to know and make the difference. New computer owners have the impression that the computer world is based on fair play, and therefore if a useful or recommended application recommends another one, the third recommended application should automatically be good. This practice is marketed to inexperienced users by manufacturers to gain market share. 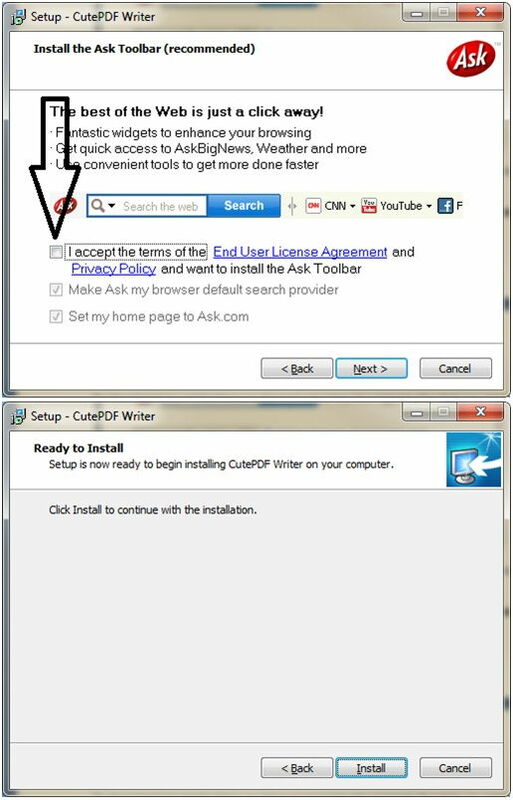 For example this application CuteWriter is used to convert any type of documents to PDFs. So I am recommending it as a great application because it’s free and it can get you over a lot of headaches. But the application is self comes with the Ask toolbar. It’s another search engine and a novice user might be tempted grant his OK for the application installation. 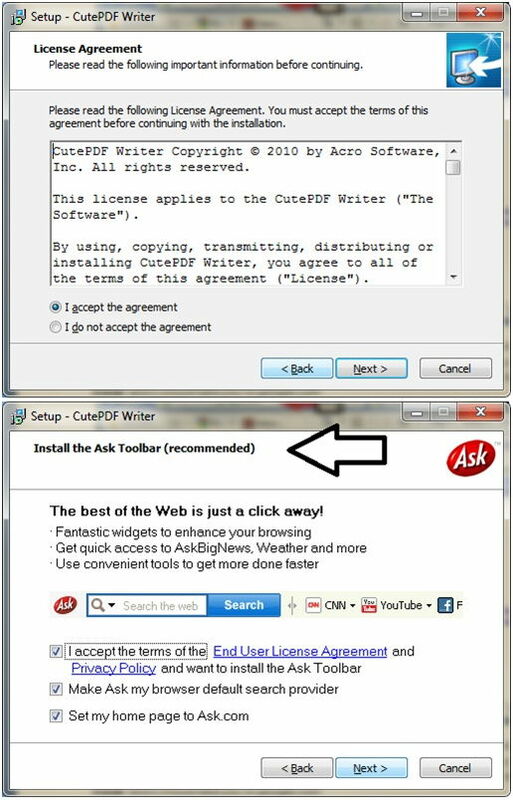 The best way is to not allow it because you initially wanted just the PDF converter, not the ASK toolbar, and besides we don’t even know what the ask toolbar is going to change. What if we don’t like the changes? Then it would be a lot of work to try to undo the changes but system restore would in this situation. Follow the images to see how installing software can get you in for more than you signed for. And sure enough the recommended toolbar, just un-check the checks and continue with the installation, without the toolbar installation and you should be fine. Now click the install software button to perform the application installation. Installing software is not easy and it should never be taken lightly, that is why this post is here.